I recently read a study in the medical journal Gastroenerology, that has inspired me to geek-out a little on you to discuss the microbiome. The microbiome is the collection of foreign cells, predominantly bacteria, that reside on and within us. In fact, there are 100 trillion of these inhabitants in our bodies—about 3 pounds of them! The microbiome can be beneficial to us, when we carry the right bacteria, or in some cases detrimental, when we carry the wrong bacteria. New research has implicated these bacteria in disease processes as diverse as asthma, cardiovascular disease, autoimmune diseases, inflammatory bowel disease, obesity, type 2 diabetes, and even cancer. The bacteria contribute to our immune system, gut health, and energy balance. 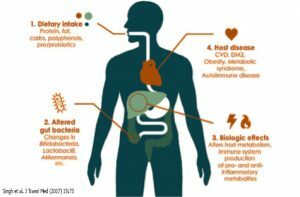 In terms of energy balance, studies on the microbiome suggest that obesity is impacted by the types of bacteria in the microbiome. Specific types of bacteria are associated with harvesting excess energy—weight gain—and others are associated with reduced weight. One study, using a mouse model, examined the idea of transplanting the microbiome of genetically obese mice into lean mice that were raised in such a way that they had no bacterial exposure, and therefore, no microbiome of their own. The transplantation of the “obese” microbiome induced obesity in the lean mice, with no change in diet. Certain bacterial species are also involved in up-regulating cells of the immune system, protecting us from harmful bacteria. Other species produce butyrate which keeps the cells of the colon healthy and has an anti-inflammatory effect. In examining the types of bacteria present in the microbiome of lean, healthy subjects, compared to obese subjects, the healthy subjects have a more diverse population of bacteria. Lean, healthy subjects have increased populations of beneficial types of bacteria, while obese subjects have decreased populations of beneficial bacteria. In fact, obese subjects have more of the energy harvesting bacteria leading to a propensity to continue to gain weight. They also carry more bacteria that have endotoxins, toxins that enter the body and lead to inflammation that may contribute to coronary disease and insulin resistance. Nutrition has a significant impact on the types of bacteria that colonize our guts. Diets high in sugar and fat decrease the diversity of the microbiome and also lead to predominance of species that harvest excess energy and species that produce endotoxins. The bacteria that predominate with these diets also lack the anti-inflammatory effect of the beneficial bacteria and they do not up-regulate the protective immune functions either. We also know from studies, that the microbiome is changeable. In fact, changes in diet can lead to a change in the microbiome within 48 hours. The study I referred to initially, explored what we know about beneficial bacteria in the microbiome and the impact of nutrition on the system. The study was small, only 22 cases and 20 control subjects, but the results are interesting and suggest the need for further research. Researchers added inulin, a favorite “food” source of healthy bacteria, to the diet of 22 children ages 7 to 12 years old who are affected by obesity, and gave a placebo to 20 similar children as a control group. After 16 weeks, with no changes to their diet, the children who received the inulin showed decreased weight, body fat percentage, triglycerides, and inflammatory markers compared to those who received the placebo. Examination of the microbiome of the subjects demonstrated a significant increase in the beneficial species of bacteria in the inulin-receiving subjects compared to those who received placebo. The researchers concluded that the prebiotic, the inulin, selectively altered the microbiome leading to the improved health outcome measures. Thanks for educating us about this topic. Great! Glad you enjoyed it!